55. Oplontis. 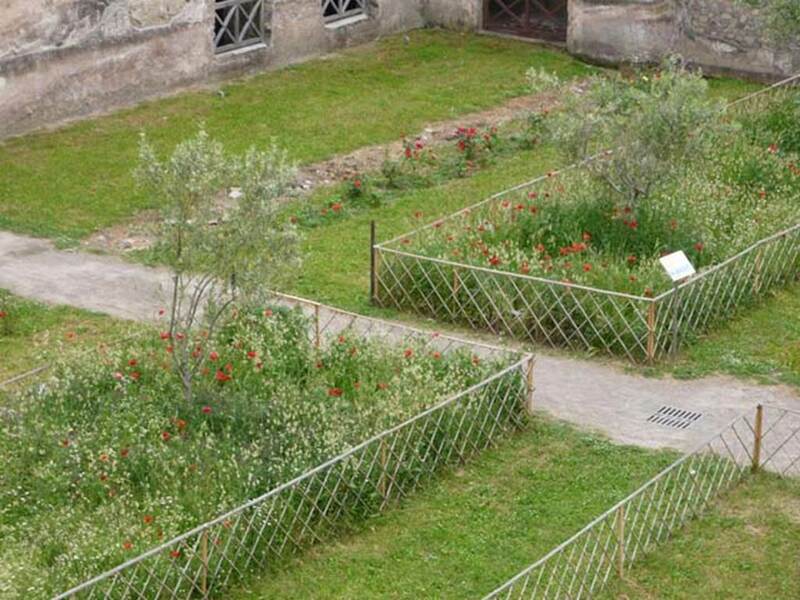 Villa di Poppea or Villa of Poppea or Villa Poppaea or Oplontis Villa A. 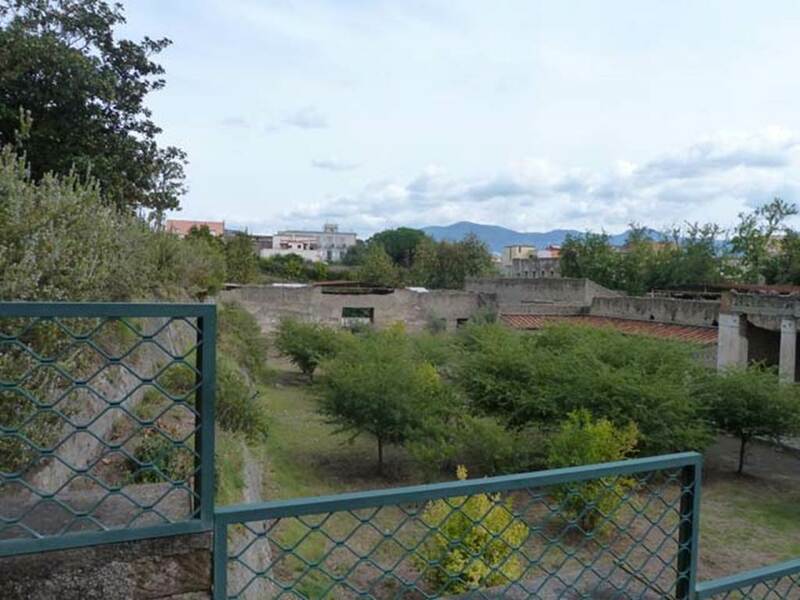 Parts of the villa were discovered in the digging of the Sarno Canal (1593–1600), the tunnel excavations of Francesco La Vega (April 1785), and Michele Rusca (April 1839 - November 1840). Excavated 1964 to 1984. 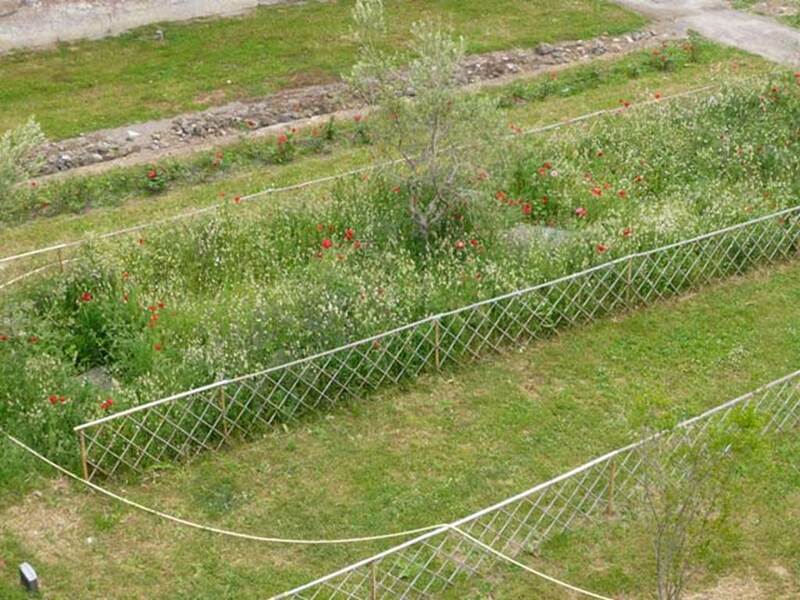 Oplontis Project excavations from 2005. Garden excavation by Wilhelmina Jashemski 1974 to 1978 and 1983 to 1984. 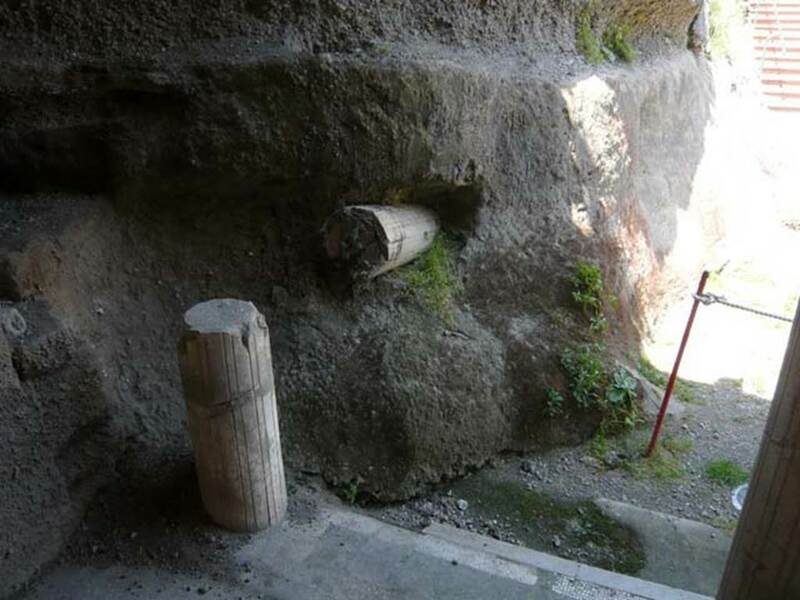 The excavations are in Via Sepolcri, Contrada Mascatelle in the centre of the modern city of Torre Annunziata. To get there from Torre Annunziata Circumvesuviana station turn left out of the station along Via Paolo Boselli. At its end (about 170 metres) turn right onto Via Sepolcri and the excavations are on the left after the red building (about 250 metres). Soprintendenza: Tourist plan of the excavations. The name Oplontis is attested solely in the Tabula Peutingeriana, a medieval copy of an ancient map of existing roads in Italy at the time of the Roman Empire. In this map the name Oplontis indicates some structures positioned between Pompeii and Herculaneum. 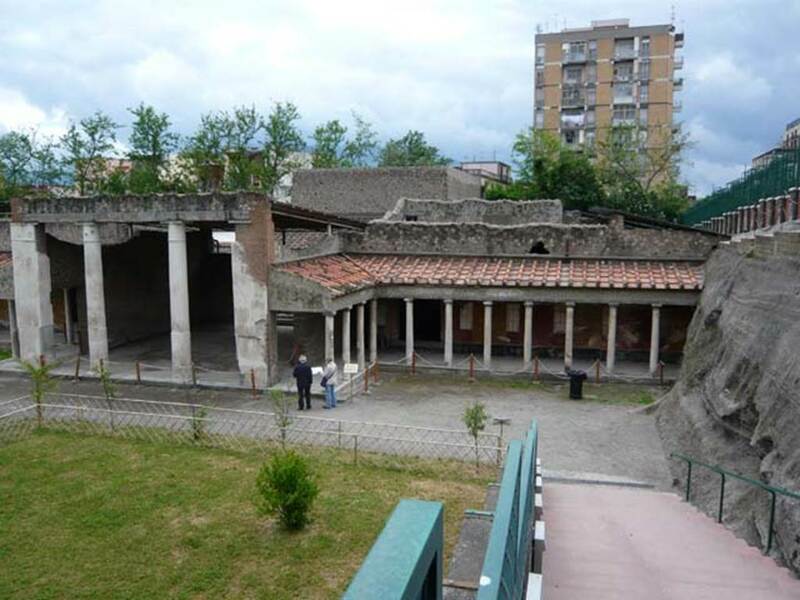 A thermal baths structure at Oncino, under the current Terme Nunziante, attributed by A. Maiuri to the Consul Marcus Crassus Frugi. Recent finds in Via Andolfi. 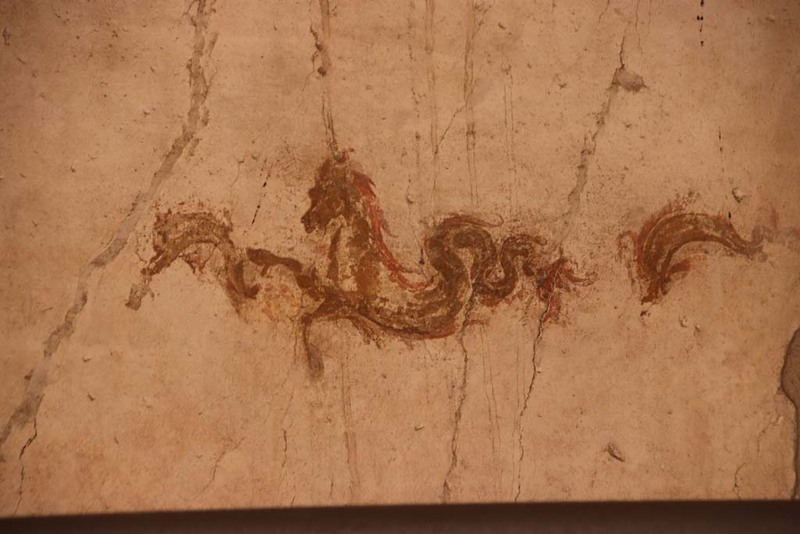 There is a comprehensive bibliography at the Oplontis Project web site: See Oplontis Project Bibliography. After this are more Jashemski excavation photographs arranged by year so that you can see the villa as it emerges from the lapilli over the years, and also follow the excavation and casting techniques used. The Villa is 28 feet below the street level of the town. It is entered via a long and deep staircase that leads to the north garden 56. 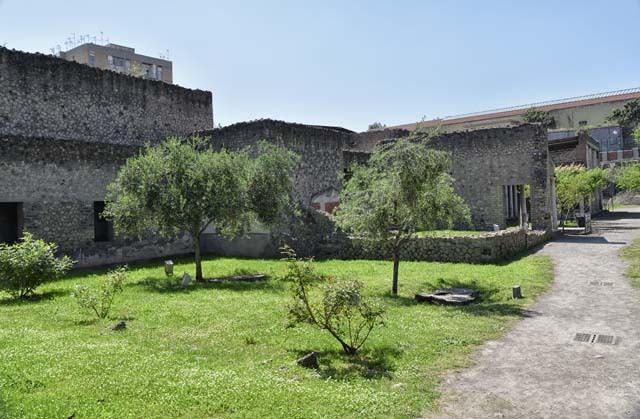 The sheer walls of volcanic ash and the surrounding modern buildings dwarf it, making it difficult to imagine the towering location and expansive views that the Villa would have enjoyed in its heyday between about 50 B.C. and A.D. 79. 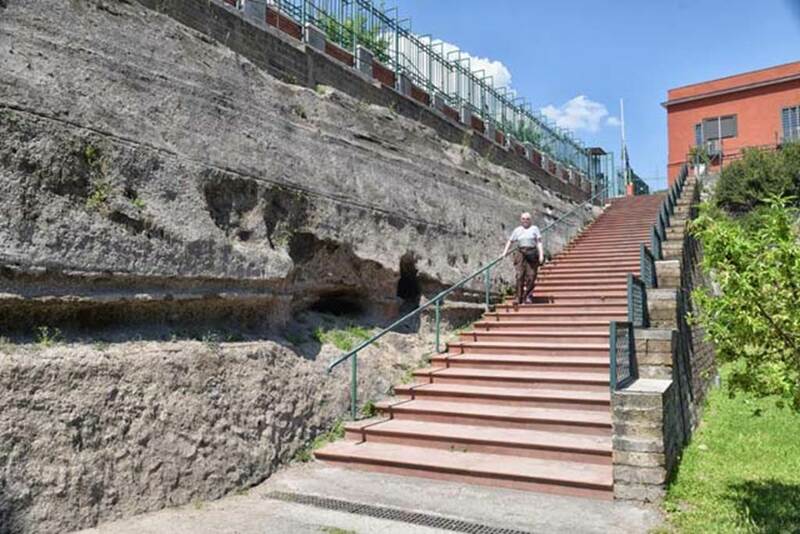 Cores taken by archaeogeologist Giovanni Di Maio revealed evidence of man-made structures below the cliff, suggesting that retaining walls and ramps provided access to and from the seashore. Being able to arrive from the sea as well as the land would have been an important feature of luxurious Roman villas on the Bay of Naples. 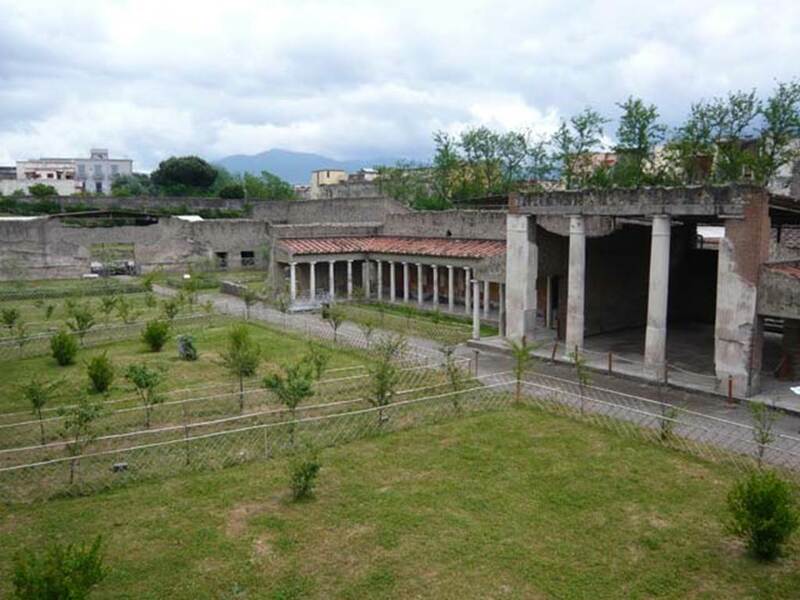 See Oplontis Project Introduction for more detail. Oplontis Villa of Poppea, May 2010. SANP description notice-board by the entrance gate to the site. The ticket office is at the road level just inside the entrance gate and the villa is at a lower level. 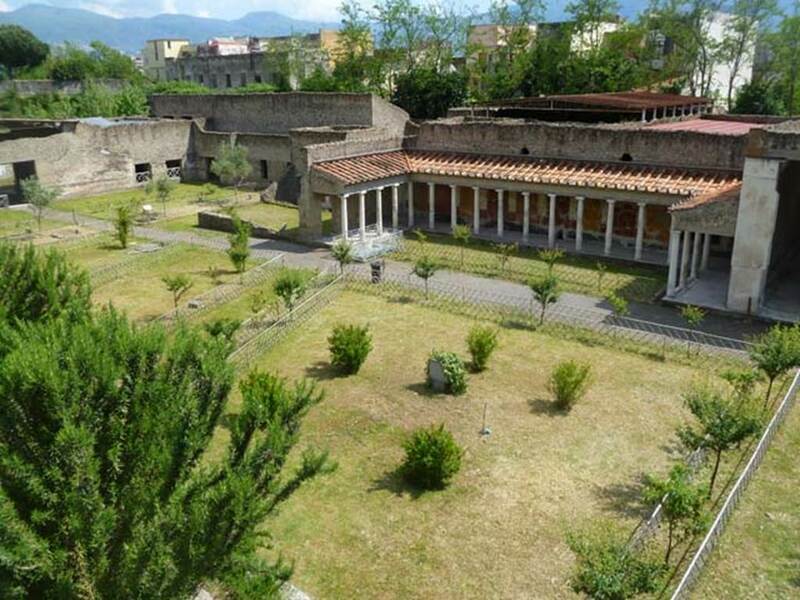 Oplontis Villa of Poppea, April 2018. Looking south across site of villa and gardens. 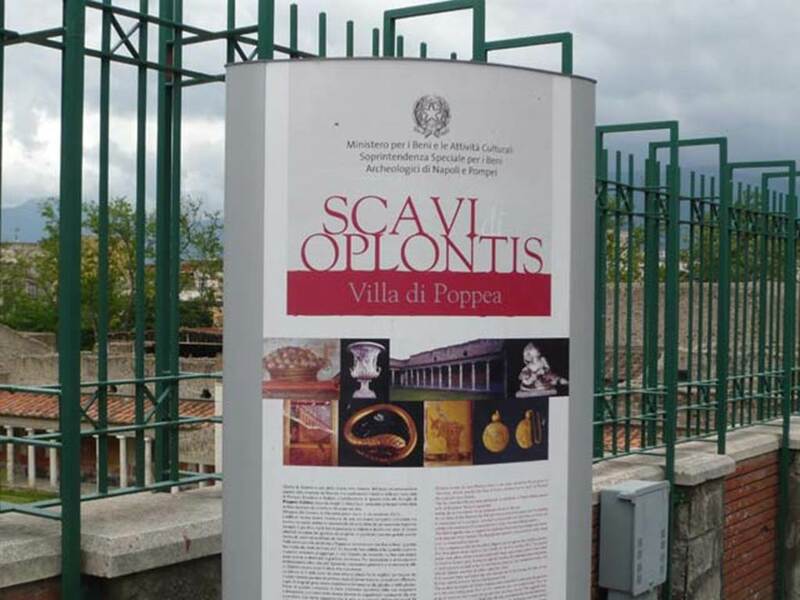 Oplontis Villa of Poppea, April 2018. Looking south from main entrance area. Oplontis Villa of Poppea, September 2011. Looking south down from the ticket office level towards villa with the entrance steps on the right. Photo courtesy of Michael Binns. Oplontis Villa of Poppea, May 2010. Looking south from entrance steps towards room 21, on left, and portico 33 on right. The villa is entered by going down a long ramp of steps. Photo courtesy of Buzz Ferebee. 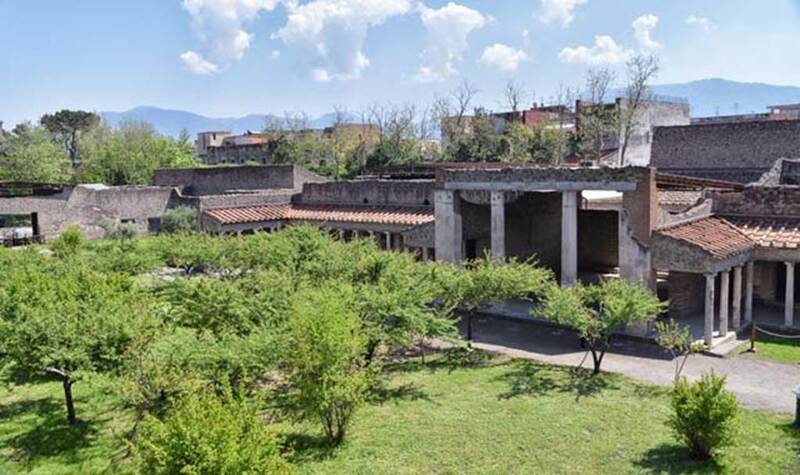 Oplontis Villa of Poppea, April 2018. Looking north up entrance steps, showing ash depth. Oplontis Villa of Poppea, May 2010. SANP description notice-board. 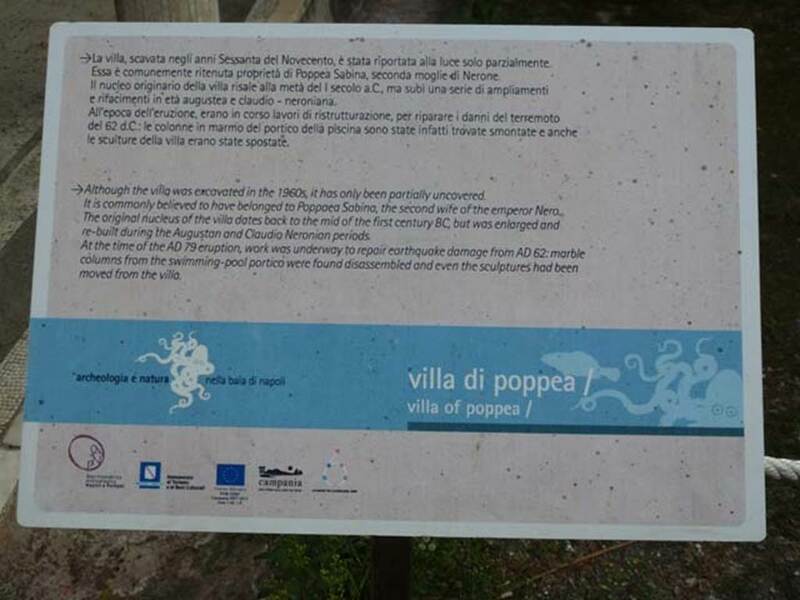 The villa was attributed to Poppea, after Poppea Sabina the second wife of the Emperor Nero, on the basis of an inscription found on an amphora. It had two building phases, the first in the middle of the first century BC, and the second in the Claudian era. The garden sculptures were found away from their original location and the household goods have not been found. 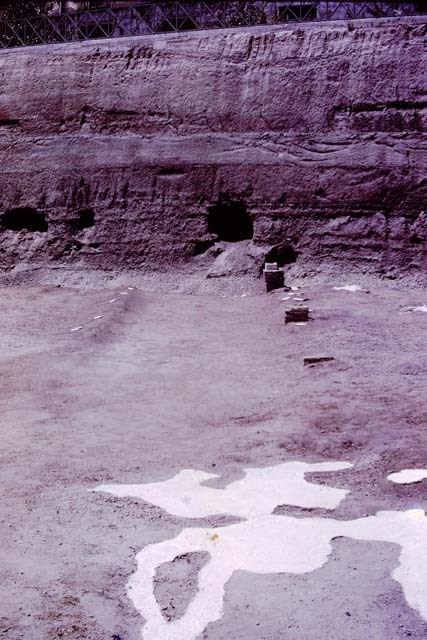 This suggest that the villa was uninhabited and undergoing refurbishment at the time of the eruption in 79 AD. Oplontis Villa of Poppea, September 2011. Description noticeboard. Photo courtesy of Michael Binns. La villa, scavata negli anni Sessanta del Novecento, e stata riportata alla luce parzialmente. Essa e comunemente ritenuta proprietà di Poppea Sabina, seconda moglie di Nerone. 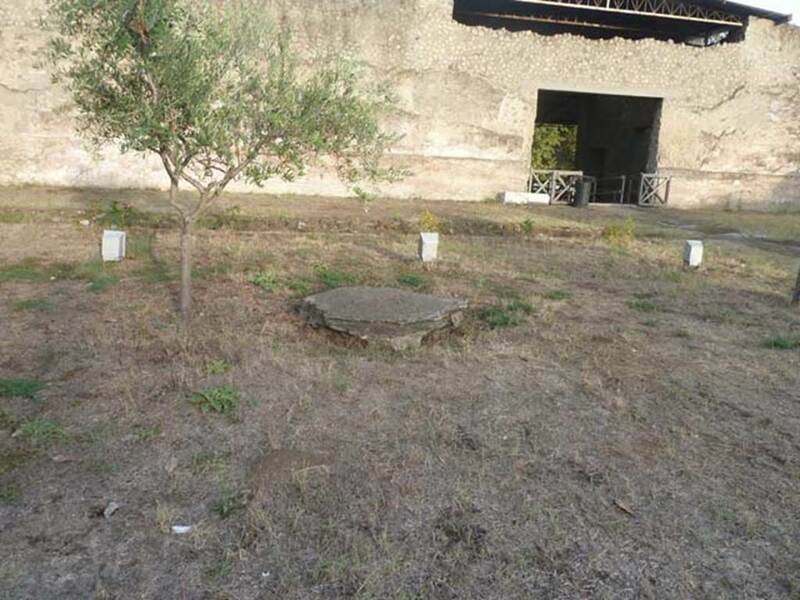 Il nucleo originario della villa risale alla meta del I secolo a C., ma subì una serie di ampliamenti e rifacimenti in età Augustea e Claudio-Neroniana. 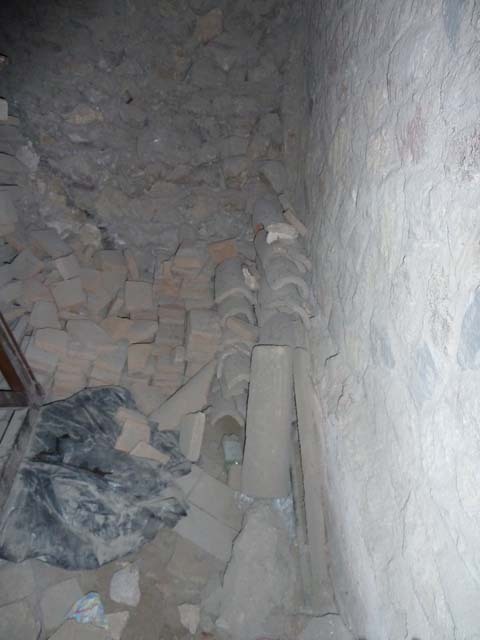 All’epoca dell’eruzione, erano in corso lavori di ristrutturazione, per riparare i danni del terremoto del 62 d.C.: le colonne in marmo del portico della piscina sono state infatti trovate smontate e anche le sculture della villa erano state spostate. 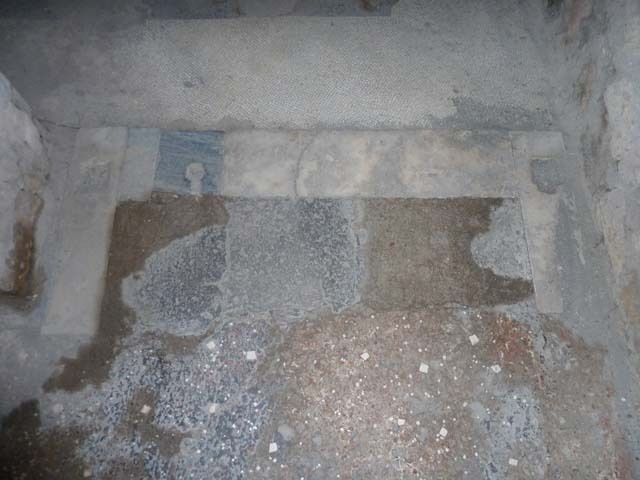 Although the villa was excavated in the 1960’s, it has only been partially uncovered. It is commonly believed to have belonged to Poppaea Sabina, the second wife of the Emperor Nero. 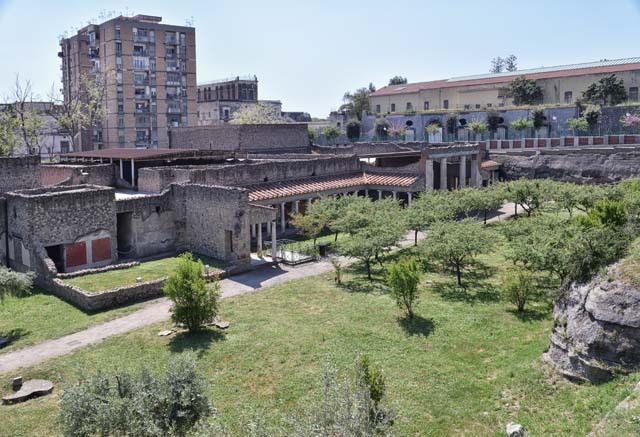 The original nucleus of the villa dates back to the middle of the first century BC but was enlarged and re-built during the Augustan and Claudio-Neronian periods. At the time of the AD79 eruption, work was underway to repair earthquake damage from AD62: marble columns from the swimming pool portico were found disassembled and even the sculptures had been moved from the villa. 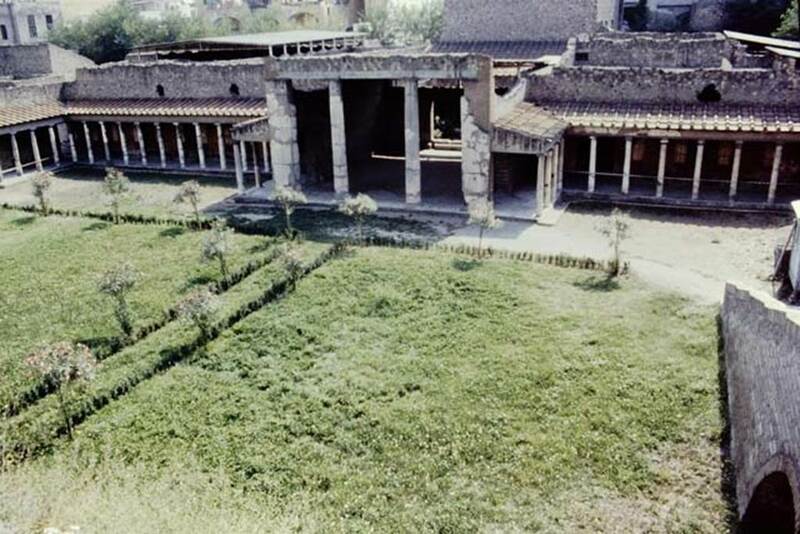 Oplontis Villa of Poppea, c.1983 or 1984. Looking south from entrance steps towards portico 34, room 21, and portico 33. Oplontis Villa of Poppea, May 2011. Looking south across north garden. The entrance steps from the roadway are on the right, leading to the west portico, room 33. Photo courtesy of Michael Binns. Oplontis Villa of Poppea, May 2011. West portico 33, looking north-west at a column snapped off and embedded in the pyroclastic flow debris. 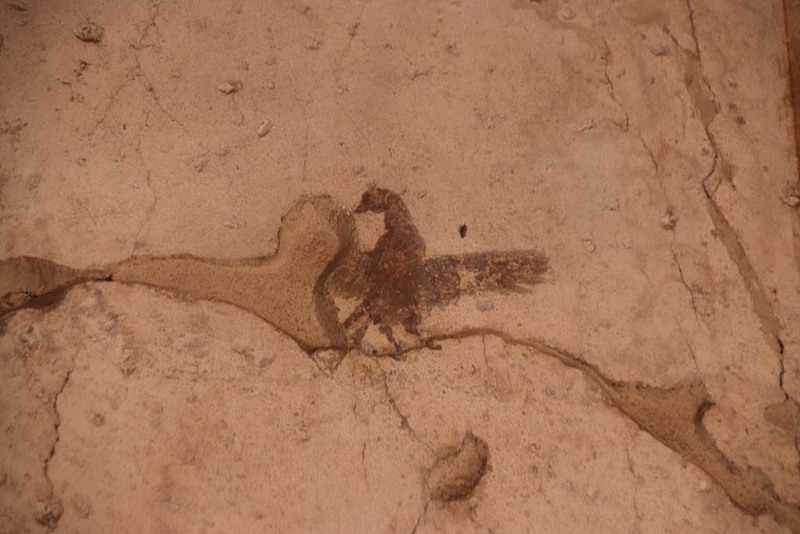 This can be seen on the extreme west of the portico, at the bottom of the entrance stairs. Photo courtesy of Buzz Ferebee. 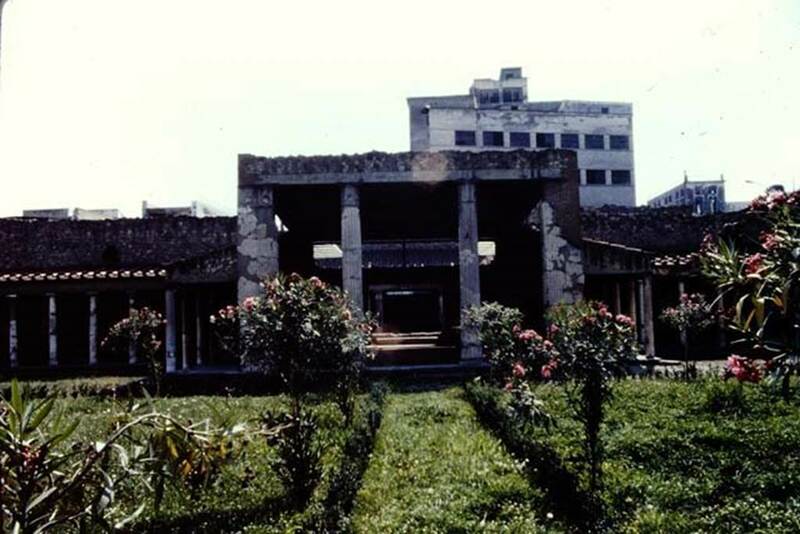 Oplontis Villa of Poppea, c.1983 or 1984. Looking south along central pathway towards room 21. 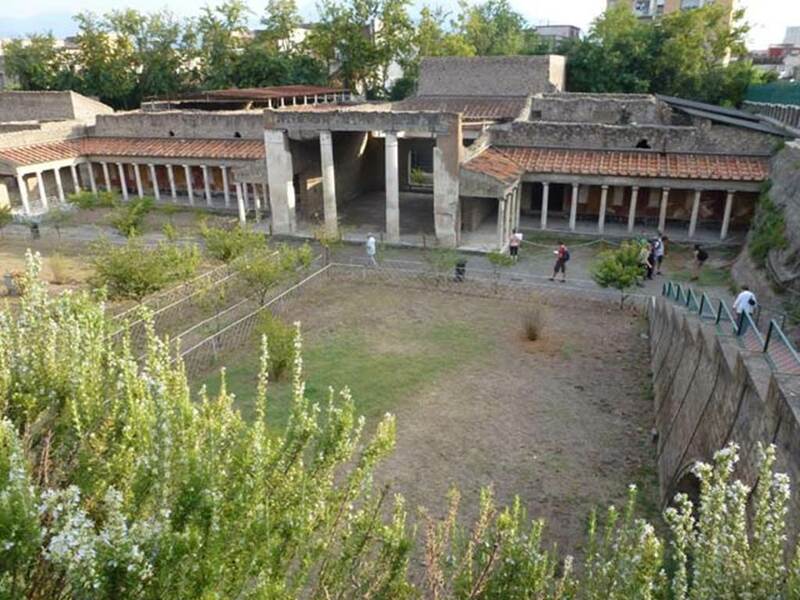 Oplontis Villa of Poppea, September 2015. Looking east across north garden. 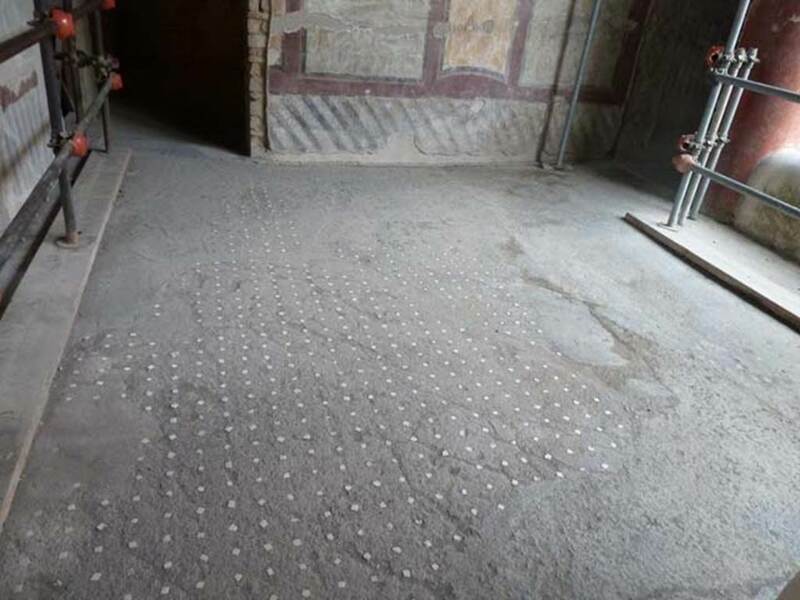 Oplontis Villa of Poppea, April 2018. Looking south-east across the north garden. Photo courtesy of Ian Lycett-King. Oplontis Villa of Poppea, May 2010. Looking south-east across the north garden. Photo courtesy of Buzz Ferebee. Oplontis Villa of Poppea, May 2011. Looking south-east across the replanted north garden. 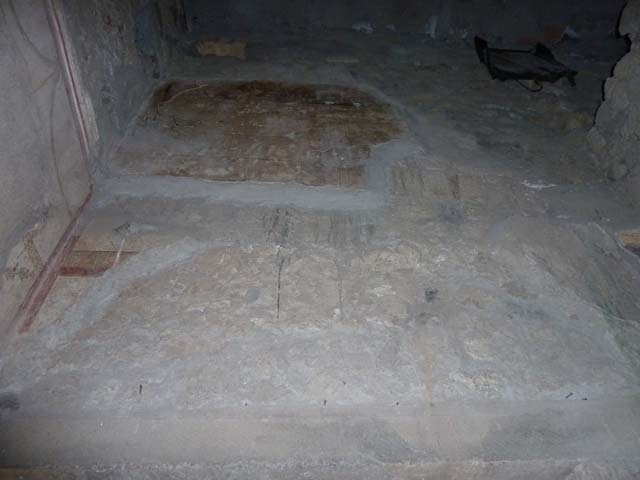 In the upper left of the photo is the doorway through to room 69. In the centre of the photo is the east portico of the north garden, room 34. On the right, just in the photo, is the entrance to the large salon, room 21, which would have enjoyed fine views across the garden. 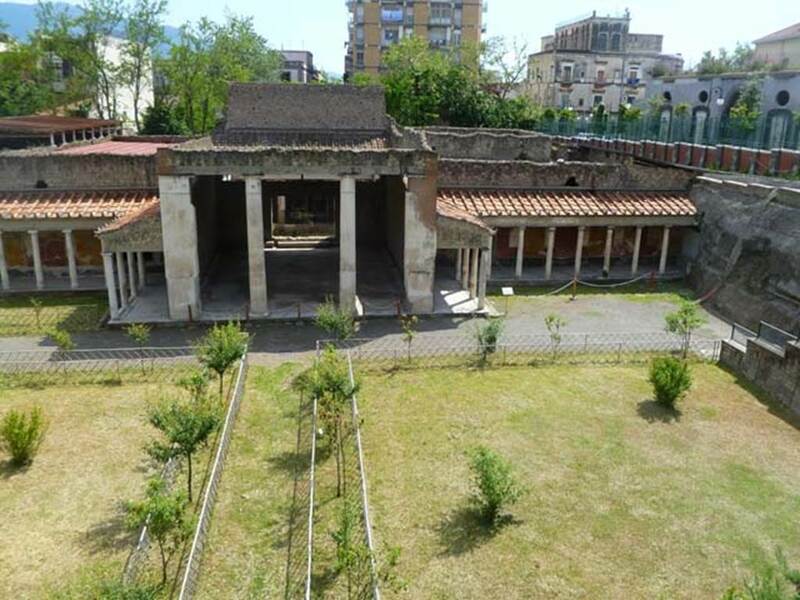 Oplontis Villa of Poppea, April 2018. Looking south across the east end of the north garden area. 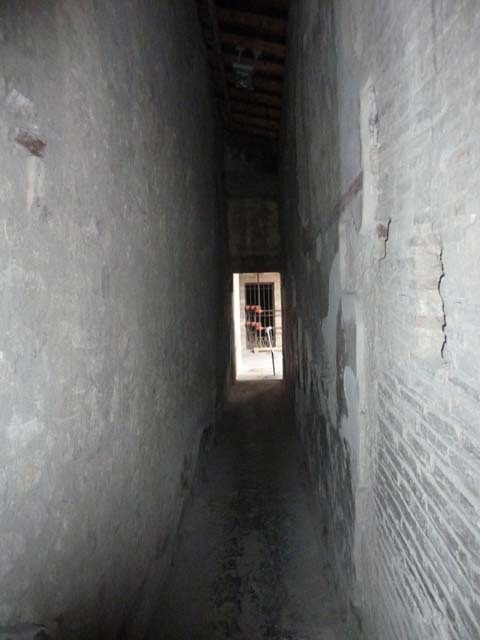 Oplontis Villa of Poppea, September 2015. East side of north garden, and one of the plaster-casts of tree-root cavity. 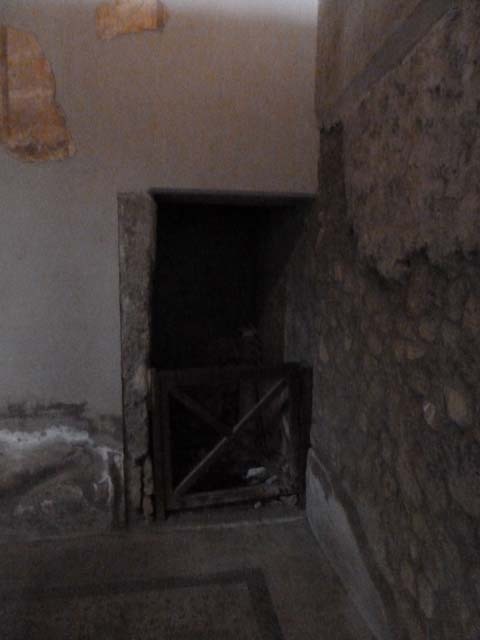 In the upper right is the doorway to Exedra 69. Oplontis Villa of Poppea, May 2010. Looking east across north garden towards the trellised area with the plaster-casts of tree-roots, now replanted with trees. Looking south-east across north garden towards the trellised areas, the pathway (left to right) leads towards the exedra room 69 in the east. 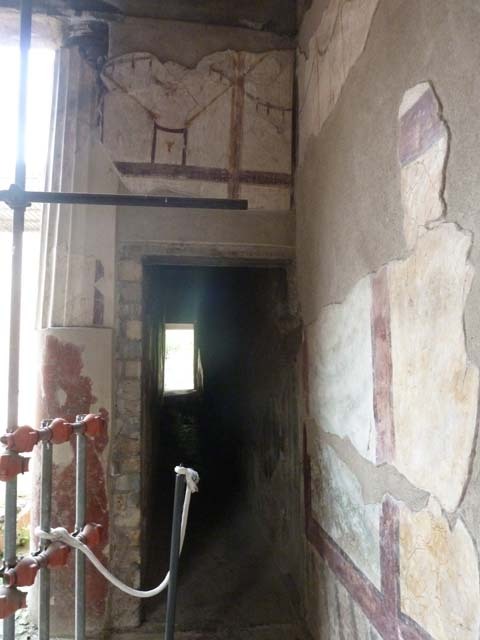 Oplontis Villa of Poppea, September 2015. Looking east along pathway towards doorway to Exedra 69. 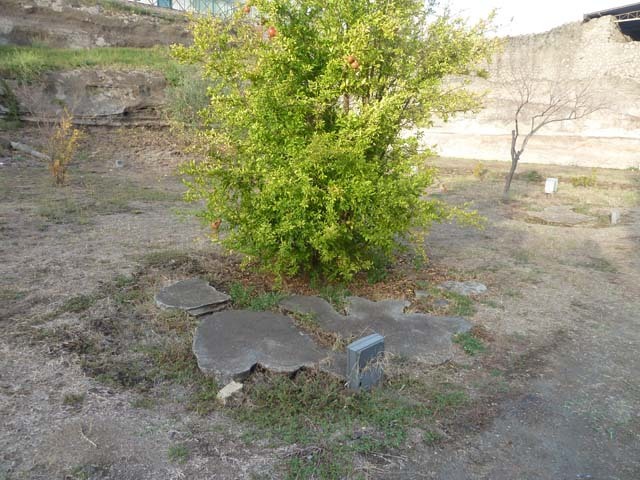 The remains of one of Wilhelmina’s root cavity plaster-casts which she proved had been a large clump of shrubs, probably oleanders, can be seen on the left. 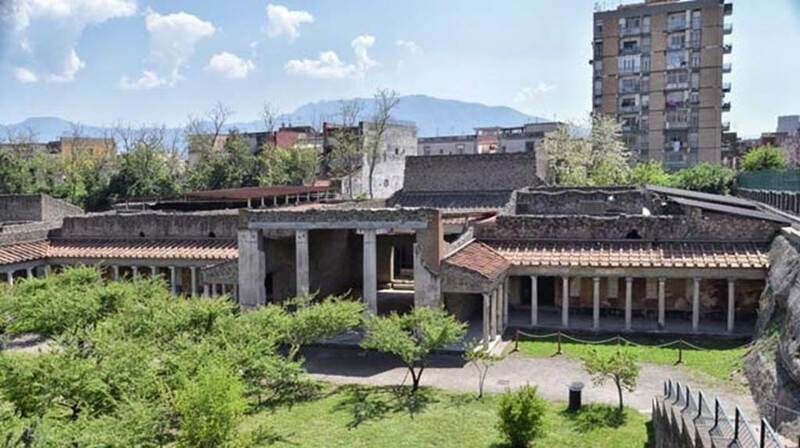 Oplontis Villa of Poppea, April 2018. Looking west along pathway in north garden, across the front of the villa. Looking from the huge root cavity found in 1974, along the diagonal line of a pathway, with bases. 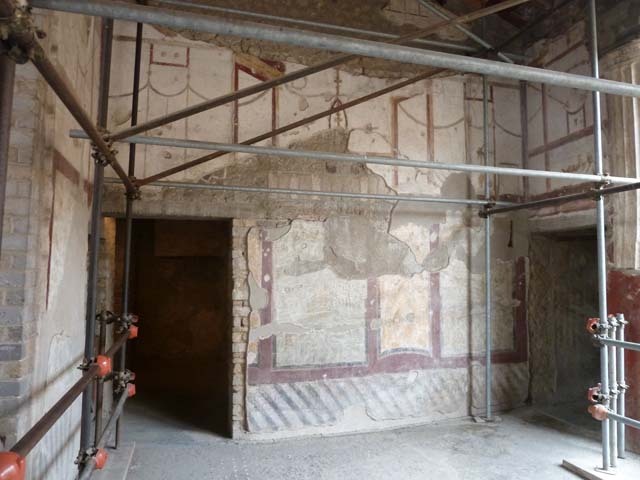 Oplontis Villa of Poppea, September 2015. Looking towards the remains of one of Wilhelmina’s root cavity plaster-casts. 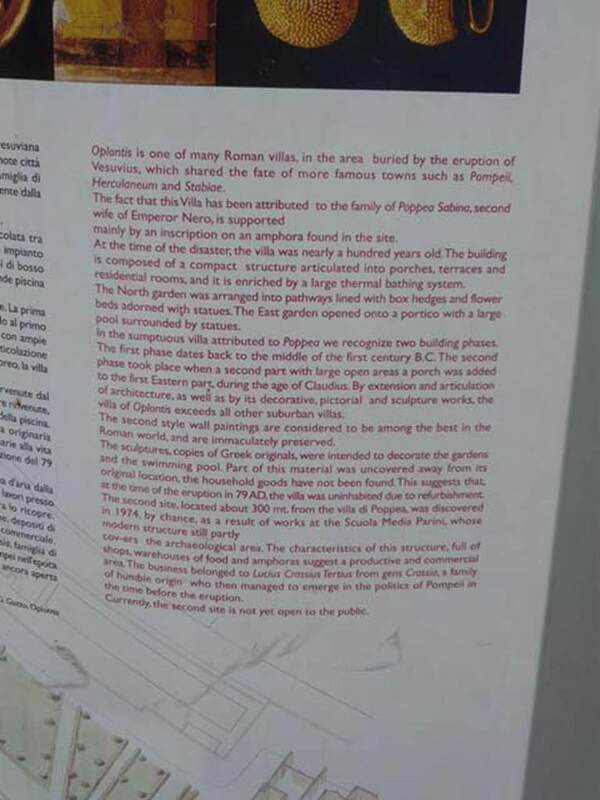 Oplontis Villa of Poppea, April 2018. Looking south-west across garden area on north side of villa. 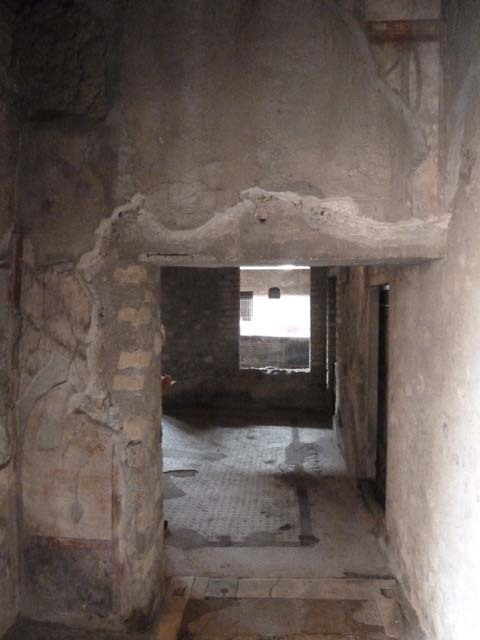 Oplontis Villa of Poppea, September 2015. Room 1, doorway in south-east corner of room 4. On the right is the doorway to room 22. 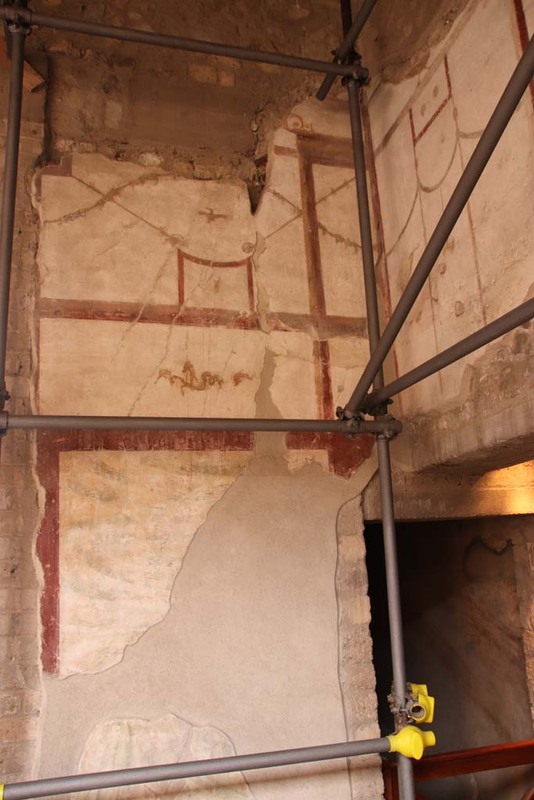 Oplontis Villa of Poppea, September 2015. Room 1, looking east across room into room 27, and through to internal peristyle 32. 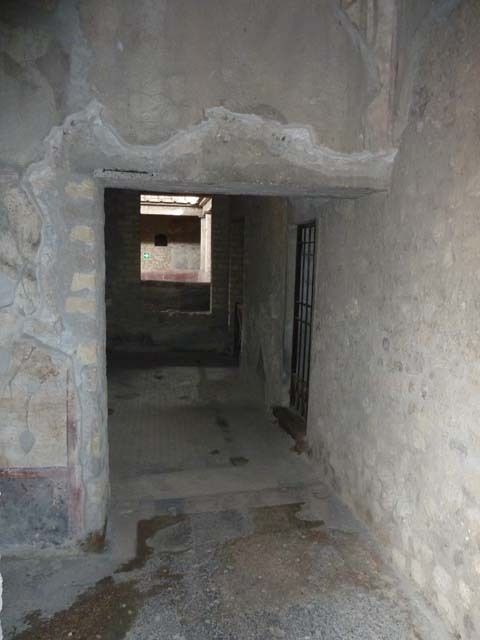 Oplontis Villa of Poppea, September 2015. Room 1, north wall. 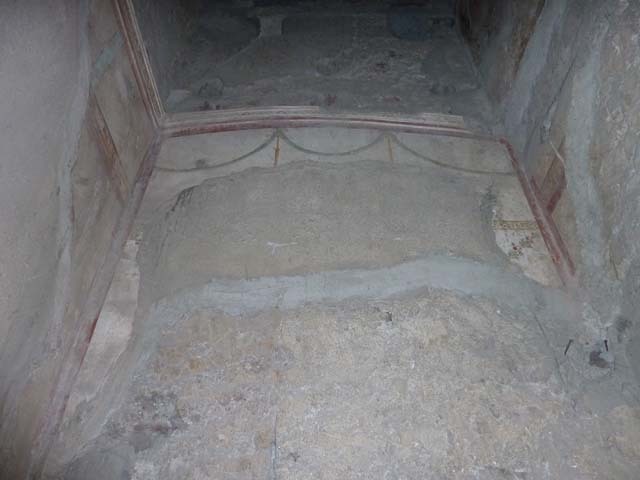 Oplontis Villa of Poppea, September 2015. Room 1, east wall with doorway to room 27. 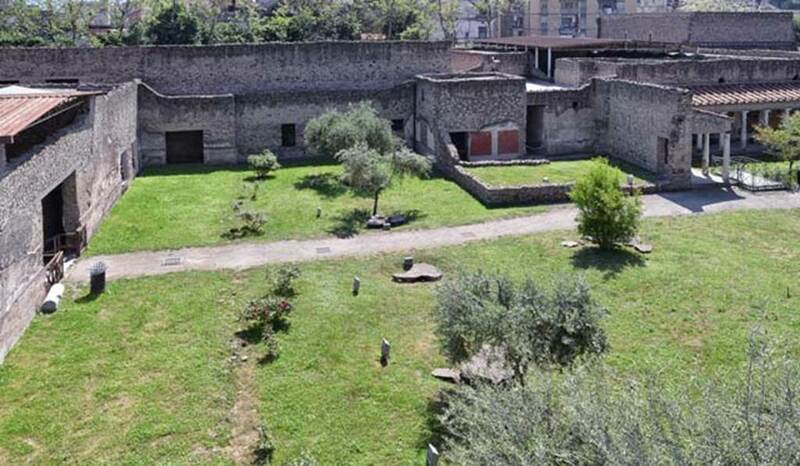 Oplontis Villa of Poppea, September 2015. 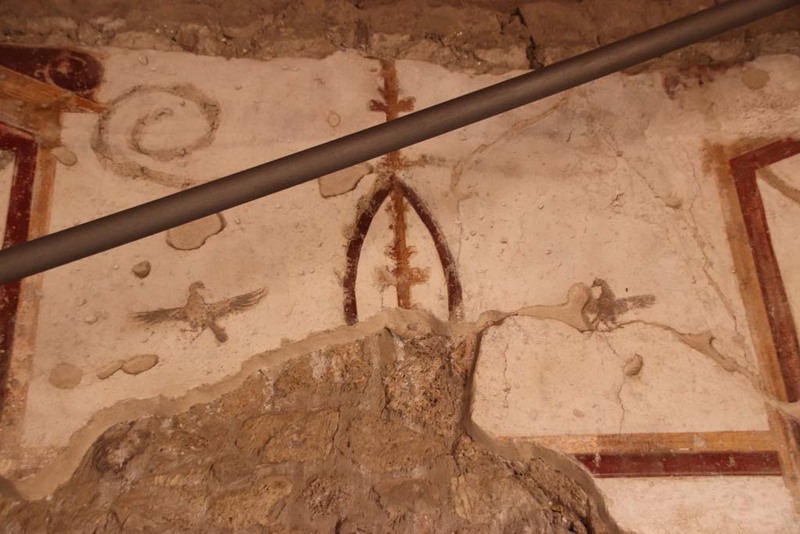 Room 1, upper east wall with remains of painted decoration. 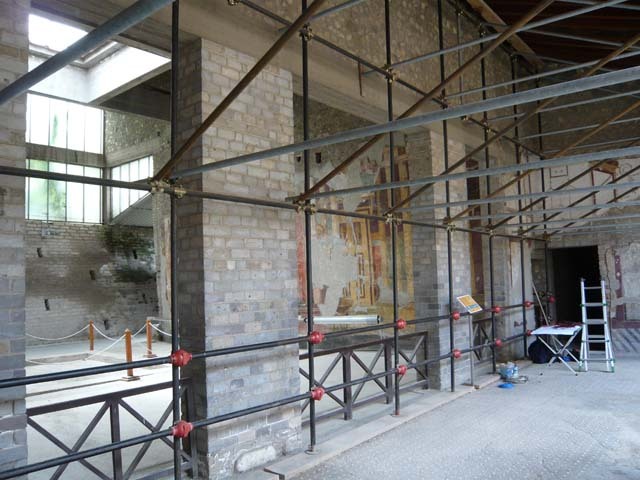 Oplontis Villa of Poppea, September 2015. Room 1, upper south wall with remains of painted decoration. 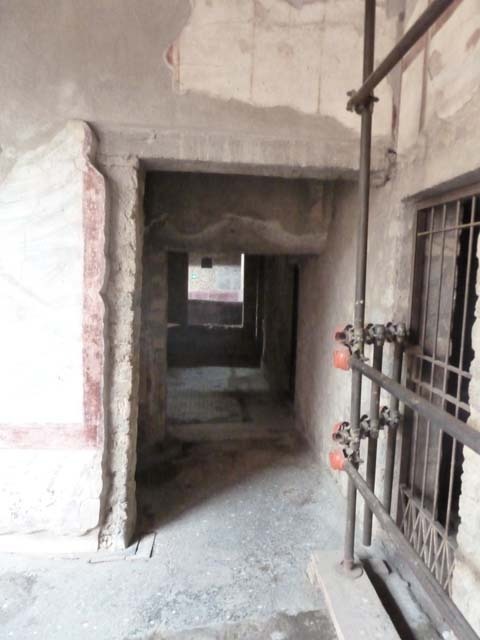 Oplontis Villa of Poppea, September 2015. 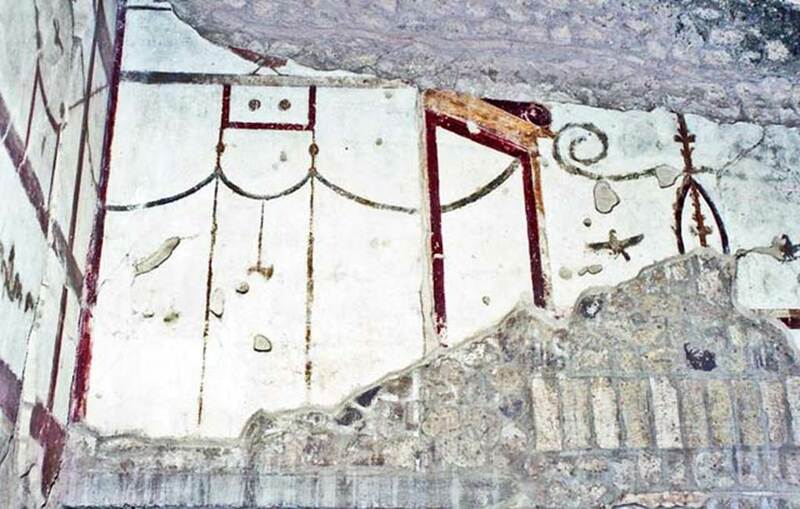 Room 1, upper west wall with remains of painted decoration. 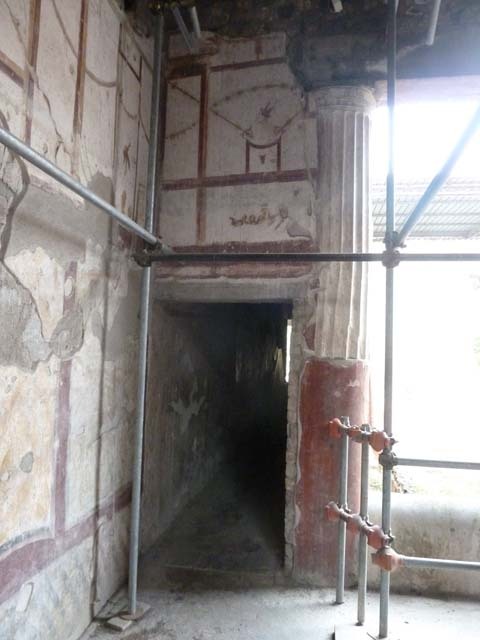 Oplontis Villa of Poppea, September 2015. Room 1, flooring. Room 2, doorway in north-west corner of room 27, the enclosed courtyard. 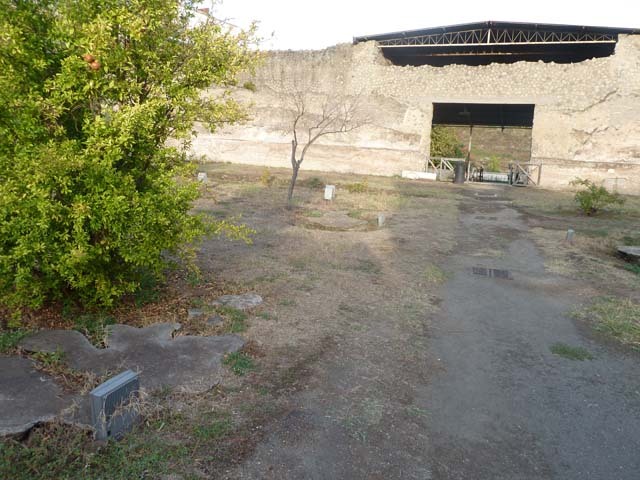 Oplontis Villa of Poppea, September 2015. Room 2, storeroom. 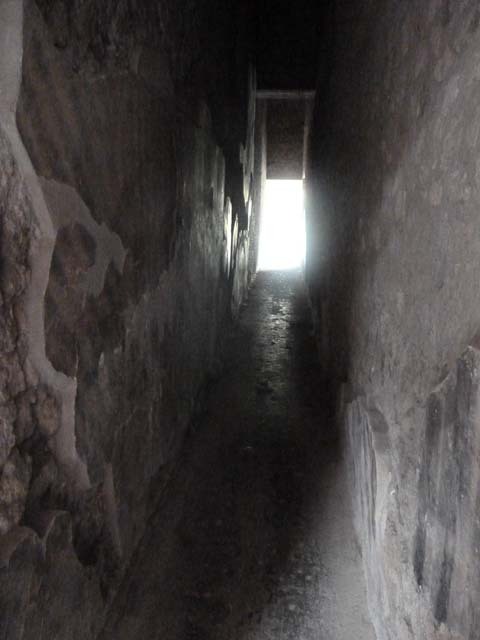 Entrance to corridor 3 in north wall of room 4, leading to east portico 34. 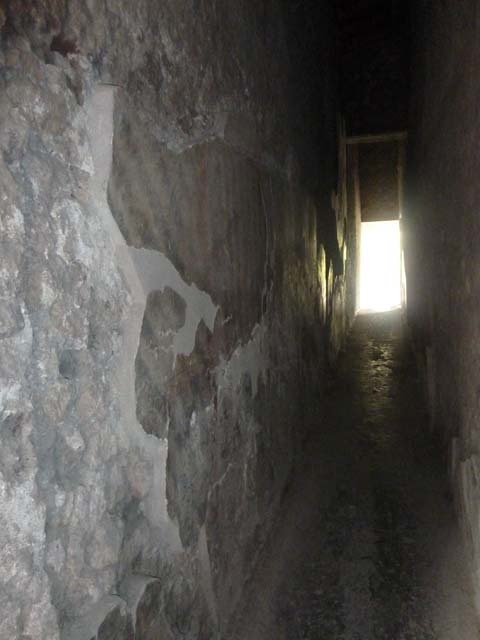 Corridor 3 leading from room 4, north-east corner, to east portico 34. 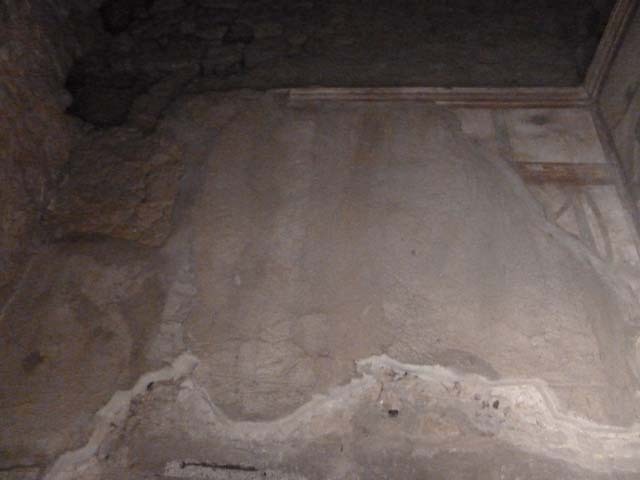 Oplontis Villa of Poppea, September 2015. 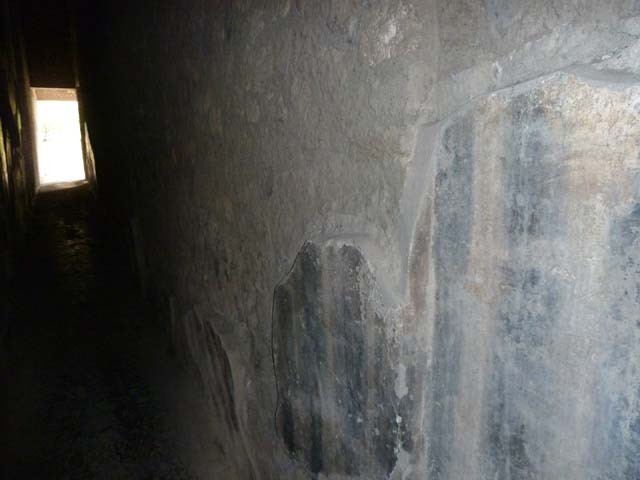 West wall of corridor 3 leading to east portico 34. 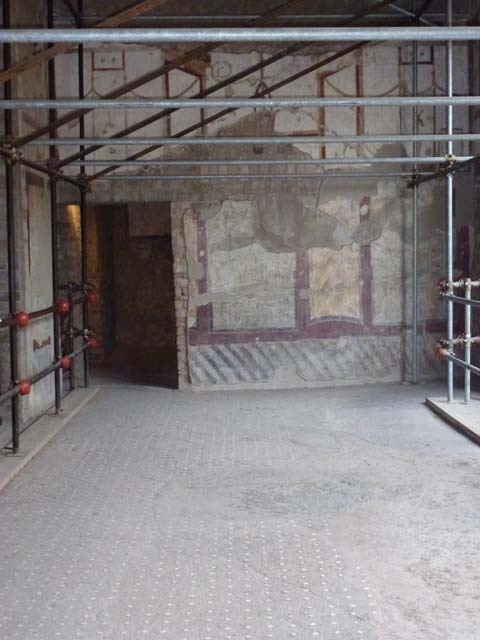 Oplontis Villa of Poppea, September 2015. East wall of corridor 3 leading to east portico 34. 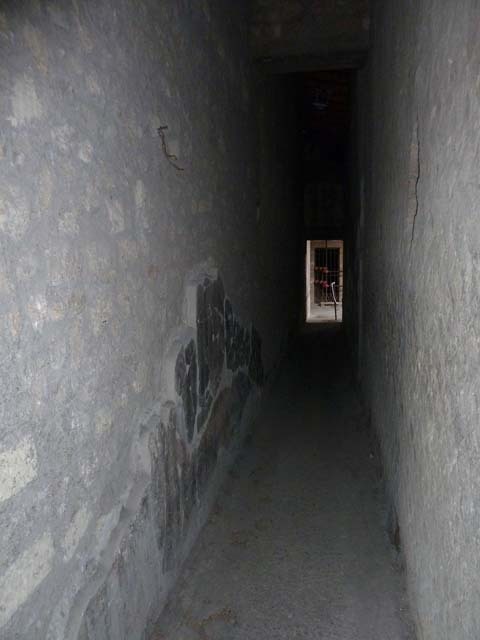 Corridor 3 leading south from portico 34 to room 4, past door to room 30. 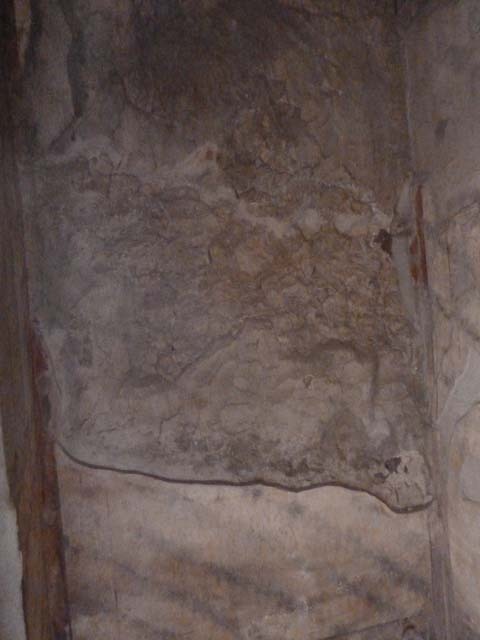 Remaining plaster on west wall of corridor 3 leading south from portico 34 to room 4. Room 4, north-west corner, and entrance to corridor 6 to the west portico, room 33. Room 4, west wall with doorway to room 9, on left and entrance to corridor 6 to the west portico, on right. Oplontis Villa of Poppea, September 2011. Room 4, west wall with doorway to room 9. Oplontis Villa of Poppea, September 2011. Room 4, painted decoration on west wall. Photo courtesy of Michael Binns. Oplontis, Villa of Poppea, October 2001. 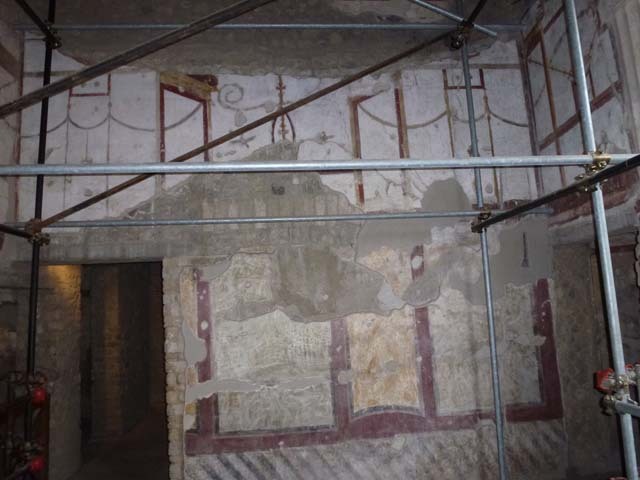 Oplontis Villa of Poppea, September 2015. Room 4, looking west across flooring. Oplontis Villa of Poppea, May 2010. Room 4, south side. Looking through pilasters into the atrium, room 5. 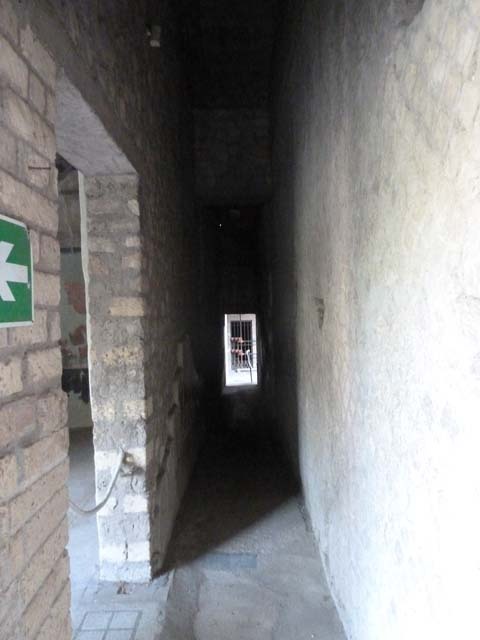 On the right is the doorway into room 9. Photo courtesy of Buzz Ferebee. Room 4, east end of north side, looking towards small entrance into room 20, the courtyard garden. Room 4, looking north-west across courtyard garden, room 20, and through window into large salon, room 21. Room 4, east wall with entrance to corridor 3 leading to east portico 34, on left, and doorway to room 1, on right. Room 4, north-east corner, with entrance to corridor 3 leading to east portico 34 in north wall, looking north.